For trains ferried across the Baltic Sea or across the Strait of Messina see www.ships-worldwide.com. Skandinavia was connected with Italy only after World War II, when the glory of the Grands Express Europeens already had faded away. Now they included also coaches of the state railways. French intentions to upgrade at least the Nord-Express Paris - Scandinavia as an exclusive sleeping-car train did not materialize. The Nord-Express did run in summer 1946 from Paris and Calais, for the first time with CIWL sleepers to Stockholm. It took the way via Nyborg and initially also Brussels and Hanover, where a branch to Berlin was detached. Finlands traditional connection with the continent is by broad gauge trains Helsinki - Turku and passenger ferries Turku - Stockholm. In the past there had been a way also by ferry boat Turku - Norrtalje, connecting with a narrow gauge "Finland Express" Norrtalje - Stockholm Ostra. From October 7 a sleeper Oostende - Copenhagen was added to the Nord-Express and at Cologne a sleeper and a Swiss or Danish car Basle - Copenhagen were attached. They did run in a new FD211/212 Basle - Amsterdam via Strasbourg. 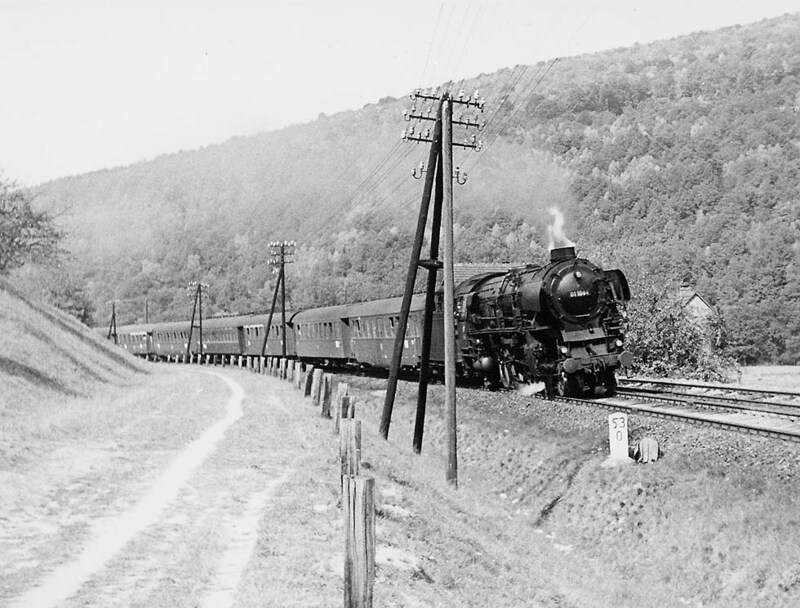 In 1947 it was replaced by a sleeper Stockholm - Zurich, from Hamburg on the direct route southward. 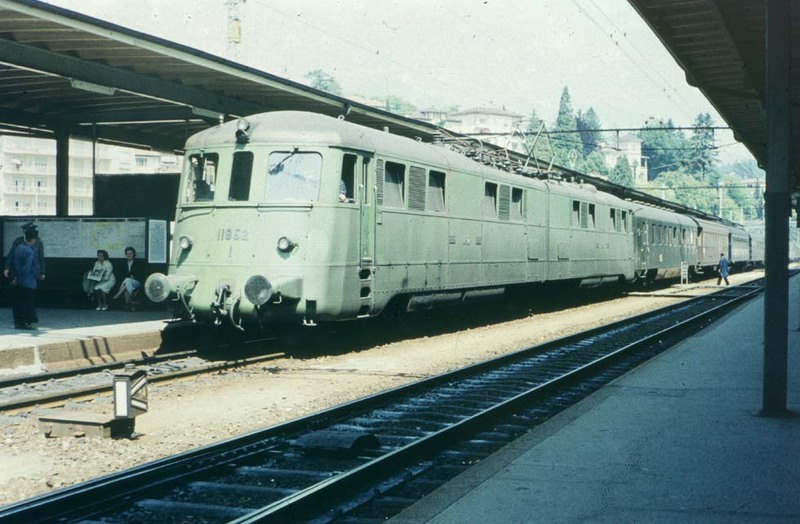 In 1948 the FD 212/211 became the Skandinavien-Schweiz-Express and in 1949 it was extended to Italy. This Skandinavien-Schweiz-Italien-Express Stockholm - Rome took the train ferries Malmo - Copenhagen Frihavn and Korsor - Nyborg. In Scandinavia it was combined with the Nord-Express, which in 1951 got a sleeper Oslo - Paris via the Helsingborg - Helsingor ferry. 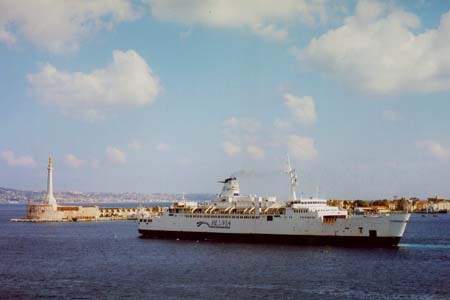 In 1953 the Skandinavien-Italien-Express changed to the new Gedser-Grossenbrode train ferry, whereas the Nord-Express kept the Nyborg route. In Denmark, a (wooden) CIWL sleeping car ran on a domestic train from Copenhagen to Esbjerg, where boats connected with England. The Skandinavien-Italien-Express of 1951 exchanged cars with a new Holland-Italien-Express. In the same year the prestigious Rheingold, now with blue DB cars Hoek-/Amsterdam-Basle, had its comeback. The Skandinavien- and Holland-Italien-Express formed in Switzerland a group of 3 trains, combined with the Oostende-Rome, the CB from Calais and even cars from the Arlberg-Orient Express from Paris. 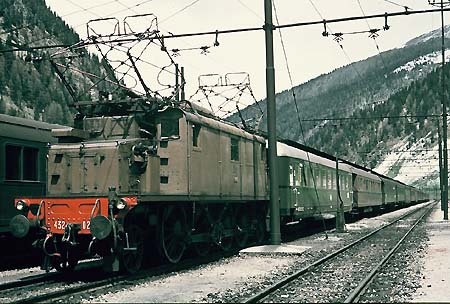 The group’s most important train was Ex 54/71, hauled on the Gotthard by the huge Ae8/14 twin electrics, with up to 12000hp the most powerful locomotives of the world. Amidst the mix of coaches on this train appeared also one of the four pre-war streamlined CIWL sleepers of the 3806-09 series, built by Linke-Hofmann. The Y Wagons-Lits series, delivered after the war initially for the Scandinavia services, were old-style, with mahogany interiors. 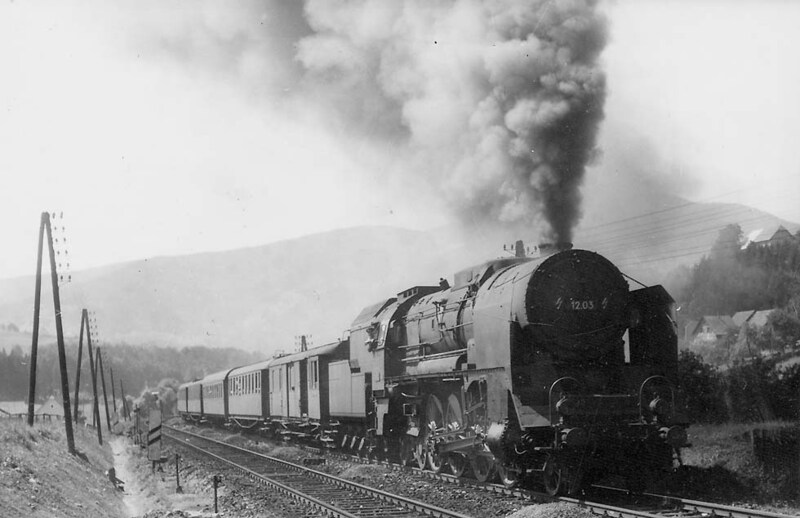 In Germany the expresses stormed the hills of the Nord-Sued-Strecke with rebuilt Pacifics of the 0110 class or the beautiful 10, originally intended by engineer Witte as a heavy 2-6-2 (maybe too heavy), but DB preferred a more conservative 4-6-2 layout (and Witte got enraged). In Denmark before dieselization, the E class Pacifics, a Swedish type, hauled most expresses. In 1960 the F212/211 Skandinavien-Italien-Express changed timetable, now called Italia-Expess, exchanging through cars with the Riviera-Express Amsterdam - Ventimiglia. From 1963 it had a sleeper Oslo - Genova (until 1966) and it took the Helsingborg - Helsingor and the new Rodby - Puttgarden ferries. The sleepers had been the modern UH types, later succeeded by the new MU. With 3 trains crossing the Gotthard and 2 ones the Loetschberg, the Italia group was so complicated, that the European Timetable Conferences always had their problem with it. That was the last epoch of the Grand Expresses. Their blue Wagons-Lits sleeping cars, loss-making and therefore taken over by the railways, were outnumbered by the corridor coaches of the various countries, up to forty years old, most ones dark green, but Italian cars brown, then grey, Dutch cars turquoise, then dark blue, Danish cars dark red, Swedish ones brown. There were the red German DSG diners and mainly on domestic night trains DSG sleepers. 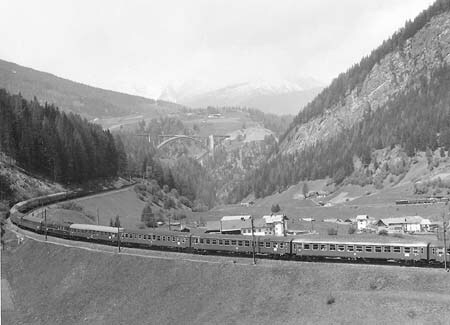 Blue Touropa and green Alpen-See-Express couchette car specials for inclusive-tours ran from Dortmund and Hamburg to Ventimiglia via the Simplon, to Ancona and Venice via the Brenner and to Rijeka in Yugoslavia via the Tauern line. Their predecessors, initially existing of refurbished green regional coaches (Eilzugwagen), had been introduced by DER in the early ‘50s. Then came the decline, 2nd class seats and corridors of the regular expresses became crowded with migrant workers. And in Italy couchette-car passengers were attacked by robbers, using poisonous gas. Or Italian strikes stopped the trains, preferably on Christmas or Easter. Well-patronized Wagons-Lits dining-cars were replaced around 1968 by lousy buffet services. In 1977 the Italia-Express was confined to Hamburg - Rome and in 1978 to Frankfurt - Rome, initially with sleeping- and couchette-cars only. In 1998 the last Italia-Expess Cologne - Rome disappeared. 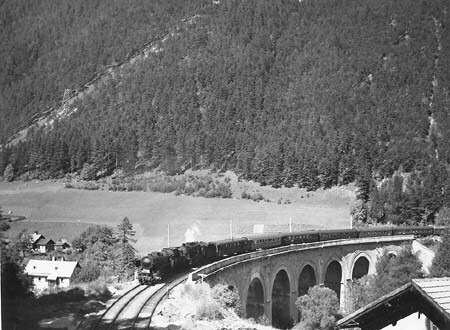 On the Brenner line there was an Alpen-Express (Copenhagen-) Grossenbrode - Munich - Rome, but it had no through sleepers. 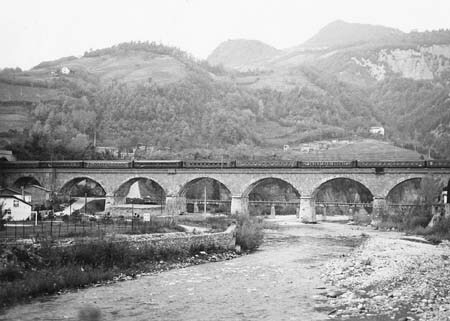 For some years between the Brenner and Bozen traction still was by the old three-phase current locomotives of the series E554, then E432. The pre-war connection Scandinavia - Italy by the way of the Trelleborg - Sassnitz train ferry and with change of trains at Berlin never re-emerged. In 1936 it had been accelerated by the Ruegendamm, connecting Sassnitz with the mainland, but at the end of WW II Germans destroyed the dam. 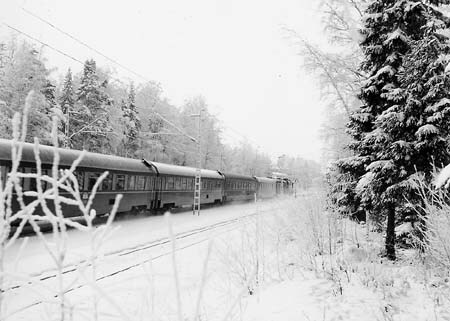 Only in 1954 a train Stockholm - Berlin Ost via Sassnitz on Ruegen island replaced the Balt-Orient-Express branch from Stockholm via Odra Port. Already in 1948 difficult negotiations led to a Copenhagen - Prague service using the Gedser - Warnemuende train ferry, later confined to Berlin. From 1955 a fast diesel railcar set (type “Leipzig”) of DR offered a daylight journey Sassnitz - Munich as “Sassnitz - Express” with a ferry boat connection from Sweden, until 1958. In 1959 its successor became the conventional Sassnitz -Express Malmo-Berlin-Munich (initially with a pre-war ex-WLC rebuilt from Berlin - Brest train sets? ), but transit passengers avoided this way through the Soviets’ sphere. For GDR citizens there was in 1960 a new way to the Mediterranean by the cruise ship “Voelkerfreundschaft” (the ex-Swedish “Stockholm”). Trains brought the happy passengers to its harbor Warnemuende. When nobody expected a modern night express, German railways DB introduced in 1994 new Talgo night trains, built in Spain. It was rumored that it had been a deal for Siemens: German locomotives for Spanish Talgos. These DB Talgo night trains and the new CityNightLine trains however did not go southward beyond the Alps. 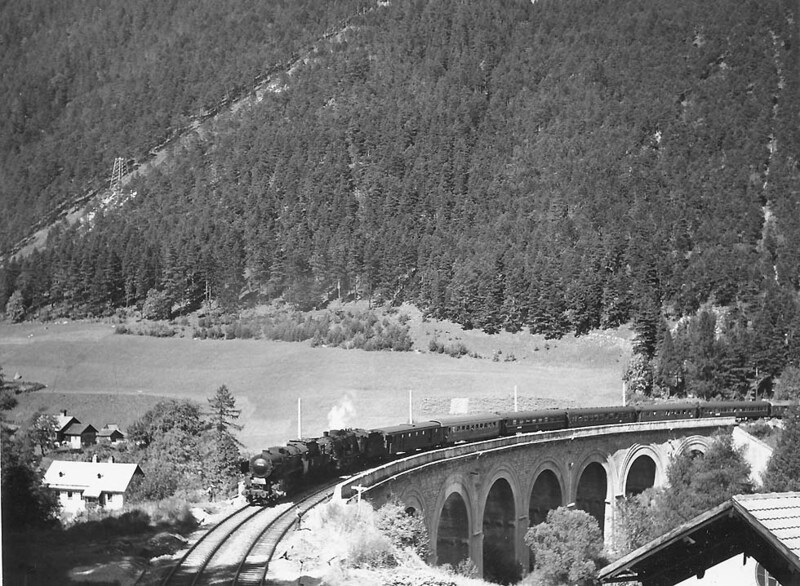 On the other way to Italy via the Semmering, a train Vienna - Rome was started in 1947. Later it became the Oesterreich-Italien-Express, temporarily with a CIWL sleeper Warsaw - Venice from the Balt-Orient-Express. Connecting trains from Berlin and Prague used either the line via Brno or via Ceske Velenice. The heaviest expresses crossed the Semmering with three steam locomotives, a 4-8-0 class 33 and a 2-10-0 in front and a tank engine pushing in the rear. For a while even the huge 2-8-4, the 12 (formerly 214) class, thundered up the Semmering, the wheels spinning. After electrification a Soviet RIC sleeper Moscow - Rome ran between 1961 and 1971 in the train Vienna - Rome/ - Marseille, later in the Simplon-Express via Croatia. In 1977 a new accelerated night express “Remus” was introduced between Vienna and Italy. 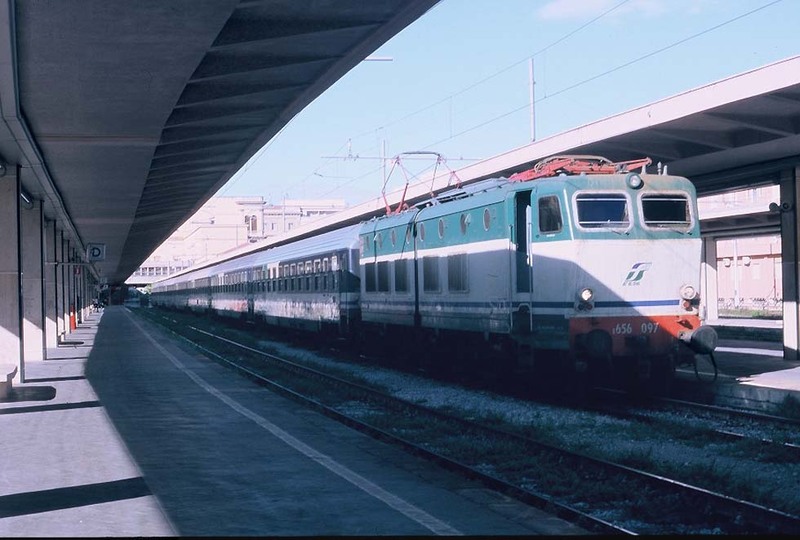 In the years to follow, many regular trains for Italy and also the Alps resorts were withdrawn and the cars of the last nice cream/red TUI FerienExpress specials were sold. Also exclusive car sleeper-trains had proven loss-making and were drastically reduced. 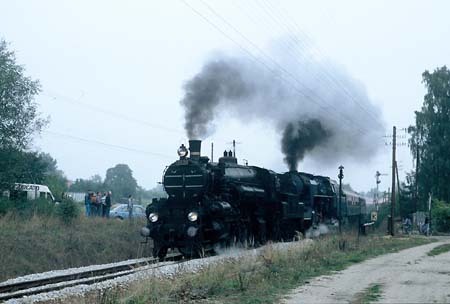 In 2005 Rome was still connected regularly by the international night expresses “Palatino” from Paris, “Roma” Geneva/Zurich - Rome/Venice, “Capri” Munich - Naples, “Remus” Vienna - Rome/ Milan and a Nice - Rome express. Many shabby migrant workers’ night trains had disappeared. 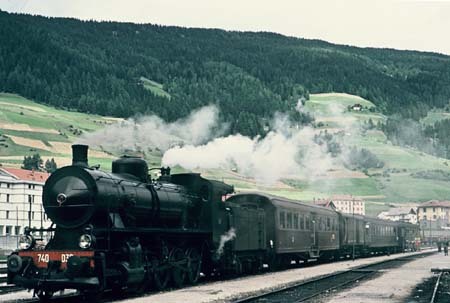 In 1988 the elegant EC “Michelangelo” day train Munich - Rome had replaced the crowded Alpen-Express, but a similar EC “Romulus” Vienna - Rome was stopped in 2000. 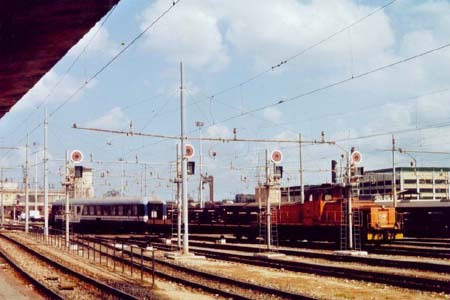 The domestic expresses from Northern Italy to Sicily, introduced after WWII, were protected by politics: Still in 2005 up to three night trains from Rome, two from Torino, two from Milan and one train from Venice arrived daily at Palermo Central station, including some sleeping-cars, but no diner, not even a bar. The other big island, Sardinia, is reached by passenger ferries. A few regional Aln668 diesel railcars are connecting its ports. In Germany also cars Stockholm - Hoek, Copenhagen - Vienna, Grossenbrode - Ventimiglia and Frankfurt - Genova. Colors: CIWL dark-blue, DB dark-green, FS brown/khaki, E646 light grey/green. Formations in Scandinavia see Bruun-Petersen/Poulsen / various books, jernbog @djk.com. 1 BRym (diner) Dusseldorf - Munich Ost, 1 - 3 Bc (couchette), 2 - 4 WL CIWL, 1 - 2 Laeq (car transporter) Dusseldorf - Rimini, 4 - 10 Laeq Dusseldorf/ Cologne Deutz/ Kornwestheim/ Munich Ost - Verona, but max. 700 ts. 1 Dz, 11 WLA5, 1 WRz, 1 WRkz, 1 Bpcb, 6 BPc, 1 Dz; from Berlin-Wannsee 1 - 3 DDm. (WL=sleeper, WR=diner, Bp=reclining chairs, D=van, DD=motorcar transporter, ordinary open twin-deck types). Traction by the usual types of electric locomotives. 1 Bpm, 7 Bvm, 1 WRmz, 3 Avm Munich - Rome, all cars FS. Colors: Grey/cream or grey/pastel, also orange, later turquoise/pastel. E656 (3 kVdc) Messina - Palermo, 1 A, 1 WLAB (Excelsior), 2 B, 1 A Rome - Palermo. E656 Messina - Palermo, 4 Bc, 1 WLAB (type MU), 2 Bc Torino - Palermo. Colors: Locomotives, coaches turquoise/pastel, WL, Bc turquoise/pastel/dark-blue. “Iginia”, a rail ferry of FS-owned Bluvia on the route Messina – Villa San Giovanni, leaving Messina in 2009 (WS).